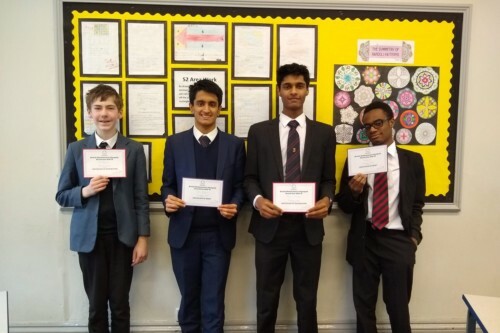 This year we had four students who, through achieving a fantastic score in the Senior Maths Challenge, qualified for the follow-up competition – the British Maths Olympiad. The Olympiad is a 3.5 hour paper in which students need to produce full written solutions to six problems. The problems are really difficult even for the best mathematicians, although the following problem from this year’s paper is deceptively easy to state! Well done to Zach Thompson (S2), Rishin Madan (U6), and Mayuran Visakan (U6) and to Kene Ezi (U6). It was a particularly strong result from Zach and Mayuran who were both awarded a Distinction.